I am a full-time professional tutor offering lessons from 10:00am to 8:00pm Monday to Friday and Saturday mornings in Poole near to Bournemouth. Whether you are at school, on holiday, retired, a shift worker, or work regular Monday to Friday 9-5, I have lesson times that are convenient for you. 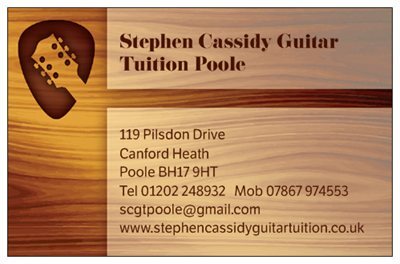 I provide fun and friendly private guitar lessons with patience in my dedicated teaching studio in Poole for all ages. Your first half-hour of tuition is completely free! 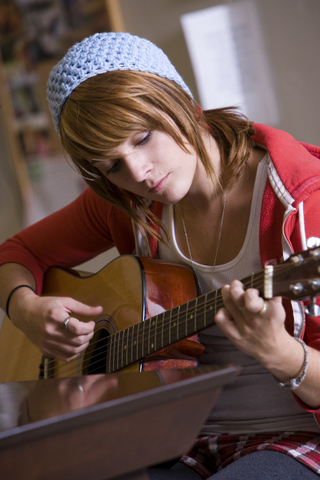 My approach and teaching methods are aimed at proving to you that you can play the guitar. I will show you and teach you how to practice in a way that builds confidence, success and progression to the next level. I do not require any 'minimum commitment' from any of my students. Neither do I require a commitment to 'regular' lessons. - I realise that there are many people who want to learn to play the guitar who may work shifts, whose work takes them away from home or for any other reason may not be able to have 'regular' lessons. - My aim is flexibility to suit you, - 'the student.' I will not ask you to give me more than three days notice if you need to cancel a lesson - no different to a Dentist! You are never too old to learn to play the Guitar. �Many of my students began learning to play the Guitar with me upon retirement. I can teach you on a one to one basis, or I can offer �shared� lessons for a maximum of two students together. � This can be an ideal solution for younger children, friends, or family who want to learn together. Discounts are given for State Pensioners, Members of The National Union of Students, Members of HM Armed Forces, five lessons paid for in advance or for shared lessons. See my Fees and Discounts page for full details!